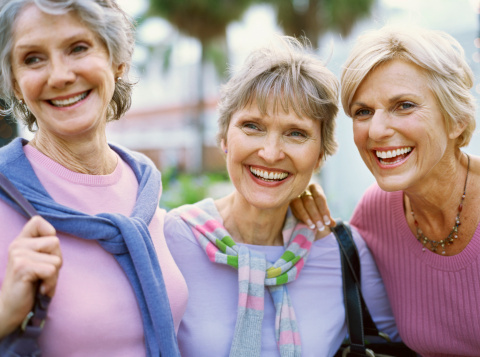 Many people believe that making new friends in mid-life can be difficult. From my experience with Silver Connections members- this is just a myth. It does take some effort, but is very possible. There are lots of people out there who need or want friends. Their lives may have been jolted by geographic moves, divorce, or loss of a spouse or partner. Some people simply wake up and realize that some of the friends they have no longer offer the support that makes their friendships worthwhile. So, how do you begin to form those new friendships after 55? Self-awareness is the first step. Pay attention to the signs of social disconnection. Are telemarketers the only people who call you in the evenings? Is watching Grey’s Anatomy or Project Runway the highlight of your week? Have you stopped cooking meals because it’s so much trouble for “only one?” Do you find excuses to strike up conversations with strangers in supermarket checkout lines? Whatever your loneliness red flags, recognize that loneliness is not a character flaw—it’s simply a way of telling you to get out, start socializing and have a life! The most important ingredient you bring to a relationship is yourself. What kind of energy and commitment are you willing to put out there in your search for connections? Make a decision that you will show up in the world as someone who is worth having as a friend. That way your energy, honesty, and caring personality will draw people to you when you meet. Enjoys some of the same activities you do? Shares your political or religious beliefs? Has something in common that you can both talk about? Doesn’t complain excessively about physical symptoms or family problems? Has a similar standard of living? Likes to listen as much as she talks? Many people are shy about joining groups. I have a friend who recently relocated to California and thought about joining some organizations, but resisted, saying “I don’t do groups.” Accept your discomfort about groups and join some anyway. It’s really the only efficient way to meet kindred spirits. And, choose only those groups devoted to activities or causes that you enjoy or are passionate about. I have seen friendships blossom within Silver Connections as members join to attend events and travel with others. They then find they have many commonalities with one another and numerous members have become close friends. The Silver Connections group was the vessel that enabled them to meet. Many of us are intimidated by the prospect of having people to our homes, especially people we don’t know all that well. So challenge yourself to dust off that old recipe book, and host a dinner party for a few people you hardly know. It will give you a night off from eating Lean Cuisine, and there is nothing like home-cooked food to help people feel welcome and connected. By inviting a small number of new acquaintances, you won’t have to worry about keeping the conversation going all by yourself—your other guests can help you. If the thought of food preparation makes you want to jump off a bridge, plan a pot luck dinner and make it a casual, but fun gathering. The important thing is to break out of your social shell and take those first steps to forming new friendships.